Facebook Shmacebook. That's what a lot of small investors are saying four days after the social networking behemoth's highly anticipated IPO went bust for them while creating massive wealth for a minuscule bunch of insiders, venture capitalists and institutional investors. And what has Wall Street apparently learned since the go-go days of the banking crisis? Apparently nothing. The stock, which went out at $38.00 per share, has fallen off a cliff since Friday, dropping 18% from the offering price. Shares were overpriced, oversold and brought to market under very dubious circumstances. As a result, the IPO, and its lead underwriter Morgan Stanley, is under investigation by the SEC, the Financial Industry Regulatory Authority and the Massachusetts Secretary of State, whose office subpoenaed the banker over its discussions with investors over the offering. All of this on the heels of news that Morgan, just prior to the IPO, advised its elite clients of its appreciably lowered revenue estimates for Facebook. The NY Times reports that one such investor dumped his entire position at $42 per share after learning of the revised forecast. Once again, Wall Street's privilidged fatcats get in and out with hefty profits while the proverbial little guy, operating in an information vacuum, gets screwed. Facebook, valued by the Street at over $100 billion, about $100 times earnings, has serious challenges in monetizing its 900-million membership and ultimately growing into this stratospheric valuation. The company itself has warned investors that it's having trouble figuring out how to make money from mobile advertising. Its members are increasingly using the service on mobile devices, yet Facebook doesn't quite know how to build its mobile ad business without cluttering its pages and negatively impacting members' experience with the service. Underscoring this potentially massive problem for Facebook was General Motors' decision last week to cancel its $10-$40-million ad spend with the company. When one of the country's largest advertisers tells you they can't make money with you that's not a good sign. Especially when you're trying to convince investors that your colossal valuation is justified by future ad sales. The controversy surrounding Facebook's IPO, and how certain Wall Street investors received critical information about the company while those on Main Street didn't, further demonstrates the need for greater scrutiny and regulation of the type of cowboy trading practices that nearly destroyed our economic system four years ago. These guys need FURTHER tax cuts. Simplistic analysis, especially as it applies to GM's announcement. Anyone who thinks you can directly sell cars on Facebook--or any social media site--is not a sophisticated marketer. GM is cutting back in many areas (e.g., backing out of its traditional Super Bowl advertising). GM's announcement was a well calculated ploy to boost their stock price (which it did). I wouldn't put much stock in its claim that Facebook ads didn't provide a direct ROI. No duh!!! Facebook certainly has its issues, but the GM announcment was a Red Herring. Simplistic analysis? 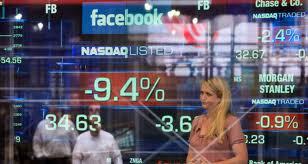 FB's valued at 100--yes, he said 100--times earnings. Can you tell me, since you're such an astute marketer and financial wizard, just how FB will grow into that valuation if its ads don't produce ROI?